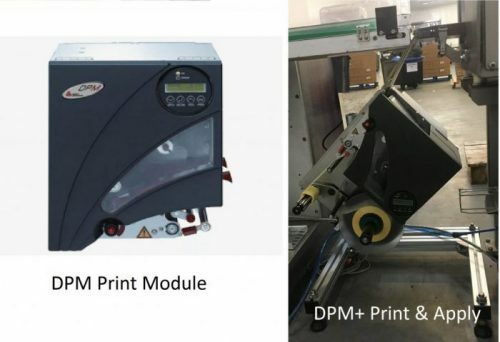 The DPM module as used in our successful SPA92x print & apply system, has been developed by Novexx (Avery) as a high speed thermal transfer engine which can directly replace slower Sato and Zebra modules printing and dispensing conventional label materials. The Sessions DPM+ is a complete print & apply machine that has been designed to be more compact than the SPA924, enabling installation into tight spaces. Both DPM and DPM+ can print text, graphics and most types of barcode in all directions at up to 16 inches per second and has built-in Zebra emulation so pre-written Zebra formats can be downloaded with ease. Both machines also offers a unique built-in foil save system to save on thermal ribbon for maximum efficiency. Print formats can be downloaded from your existing Windows label generation software using our free print driver or can easily be generated using our free software package or for more complicated designs, we can offer Sessions UK software. A further option of formats on flashcard allow the operator to select the pre-designed label via a qwerty keyboard without the need for a local PC. Because the DPM can be built into existing systems in many different ways, on request, we can assess your print and dispense needs and offer you a competitive quotation. Make your operation more efficient and faster with a Sessions UK DPM print module or replace with our DPM+ low cost print & apply labeller.